I’ve been involved with dog sports for over 25 years and began teaching in the late 1990s for a small local agility club. I’m the owner of Savvy Dog Sports and a faculty member at Fenzi Dog Sports Academy where I teach both Nosework and Obedience. 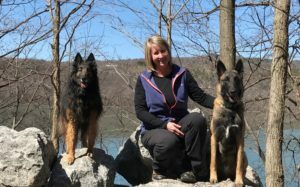 I fell in love with dog sports out of my love of teaching and training my Belgian Tervuren Rival. She opened up my world to the wonderful world of dog sports and people who share my same passion. Starting with my mix breed Dreyfus in flyball, I went on to train and compete in conformation, agility, obedience, herding and tracking with Rival. She was my Novice A dog and together we became the first CH OTCH MACH Belgian Tervuren. All those letters mean we obtained our conformation, obedience and agility Championships! We competed and placed in many regional and national events, winning Ultimate Dog (High Combined in Utility and Agility) at the All Star tournament in 2002, along with being the repeat 60 weave pole champs! My current Belgian Tervuren Savvy is also a breed and agility champion. We earned our TDX (Tracking Dog Excellent) title in the fall of 2014, intensifying my love for scent sports! In the summer of 2016, we earned our UD (Obedience Utility Dog) title and the summer of 2017 we earned our NW3-Elite title! Savvy is now an Elite 2 dog working toward her NW Championship. After learning about Nosework in 2012, it has been my focus for training and teaching others about this wonderful sport! My Belgian Malinois Drac is 3 years old and well on his way on to becoming a versatile team player, training in Nosework (NW2, SWN), tracking, obedience and agility. My newest training partner is Moxie, a 4 month old active little Belgian Tervuren! One of my favorite things is a versatile team! I truly believe that participating in multiple sports is enriching to both person and dog and builds on that mutual partnership and trust. I am a consummate learner and energetic instructor, immersing myself in everything dog training! While teaching agility early in my career, I found how rewarding it was to teach and help others. The simple truth? People just really love their dogs and enjoy doing activities with them. Knowing this helps set the tone for how I run classes; giving students ample working time, staying positive when things get challenging, and giving more than 100% of my efforts toward their development. In my other life, I am married to a very supportive husband and we are happily raising our 14 year old son. I work very hard at balancing life and hope I am succeeding at “doing it all”.